Remote BEMS management is a cutting-edge controls option. Matt Peasnall goes behind the scenes to explain the benefits. We live in an increasingly connected world and the term ‘intelligent building’ has become part of the common vernacular. Advanced technologies – combined with improved processes for design, construction and operations – provide a superior indoor environment that improves occupant comfort and productivity while reducing energy consumption and operations staffing’. Traditionally, every building application had its own isolated infrastructure and used disparate systems, standards and protocols. This resulted in duplication of effort and materials. It also produced increased complexity and cost in on-going facilities management - whereas connecting systems to a BEMS allows a much clearer window to the building services infrastructure. With any mechanical system, maintenance is a key factor in ensuring maximum levels of uptime. Although BEMS provide a large number of tangible business benefits, many customers do not derive optimum value due to plant operating inefficiently. Even where proactive steps are taken to optimise a building services infrastructure, this is often undertaken through a planned preventive maintenance (PPM) strategy, which involves replacing certain components on a time- based schedule, rather than doing so when they are actually worn or working inefficiently. Of course, PPM is still better than an uninformed, reactive approach to equipment maintenance which relies upon equipment malfunctions or breakdowns to highlight maintenance requirements; which can incur needless expense, disruption and waste. When looking to improve the way that a building services infrastructure operates, minimising energy usage is important, but the data produced by a BEMS also enables smarter decisions to be made about how to minimise maintenance costs. The question is how to go about doing it? The answer is - improved monitoring - which can build intelligence into the process and aligns with BSRIA’s Business Focused Maintenance concept (see MBS December 2017, page 18), which outlines a methodology for utilising budgets more effectively. Increasingly, organisations expect the reliability of building services to improve and BSRIA provides a calculation methodology that comprises a set of typical failure modes, consequences and preventative actions for a range of building services assets. This should be utilised when reviewing maintenance task content to ensure that maintenance activities address typical failure modes. Ultimately, assets critical to the business are maintained, while other less critical assets are managed as well as possible within the available budget. 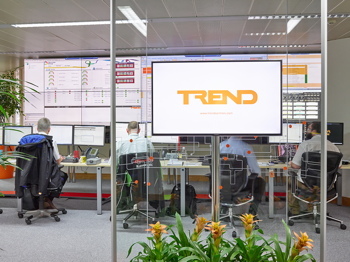 Remote connection and optimisation of a BEMS tackles demand side energy management and a centralised solution like Trend’s Operations Centre, which allows building services to be investigated and controlled off-site, supports this. This doesn’t just involve making time and setpoint changes, but also facilitates diagnostics, configuring of temporary fixes, addresses any energy related problems and predicts ways that equipment could be used more efficiently. Trend’s team of experts provide the first point of interaction with customers and a quick response to BEMS related issues by using software that continually checks the functioning of the system – including its control loops and sensors – highlighting events such as valves becoming stuck open, controls being manually overridden and other potential sources of energy waste. Intelligent application of sensing requirements and implementation of offsite labelling conventions can provide data based on analytics rules to hone in on the correct cause of any inefficiencies. Furthermore, by using data metrics, analysis, and powerful diagnostic tools, information on energy activity can be used to limit environmental wastage, which all translates directly to lower energy bills and higher efficiency. 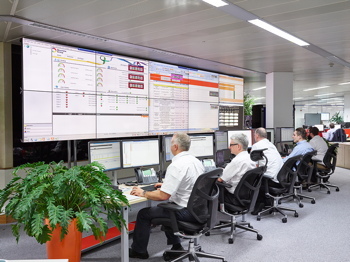 Smart connectivity strategies can also be implemented by monitoring usage patterns and demand response, so that plant uses less energy during high peak periods. Greater connectivity provides access to detailed building performance data. With PPM possibly leading to unexpected costs and poorly functioning equipment that drives up energy bills, connected monitoring ensures peace of mind by facilitating a solution that is specifically tailored to the way a building is used. Factors such as occupancy patterns, knowing what plant controls are relevant to particular areas of the building and basing subsequent maintenance activity on business risk, are accounted for and avoid a ‘one size fits all’ solution. Importantly, the use of connected monitoring should not be seen as a way to reduce unnecessary maintenance based expenditure or to exclude a systems integrator. In fact, a coordinated approach is recommended, between a systems integrator and a manufacturer’s connected monitoring facility. This approach allows the development of an on-going management and maintenance regime, yet avoids the additional costs associated with unnecessary investigations. In the event of a problem, a manufacturer’s connected monitoring service identifies the route cause quickly and works with an end user’s approved systems integrator Partner to resolve the situation. This coordinated approach avoids the complexity and expense associated with using disparate systems and service providers. Any savings can then be used to finance further investment in BEMS optimisation which, in turn, leads to further savings and creates a ‘virtuous circle’. Collecting data from a BEMS just for the sake of it is a pointless exercise – ultimately, it’s what you do with the data that counts. Working with a manufacturer that can provide state-of-the-art connected monitoring and information analysis means that BEMS data is used to best effect. This approach creates more meaningful interaction between manufacturer, systems integrator and end user, allowing them to work in partnership, make intelligent decisions about the building, and deliver lower lifetime costs.